In case the application crashes or you are not able to create a Report File, please submit only the Debug File. This will help to find the reason of crash. In order to create the Debug File, HWiNFO32/64 needs to be run in Debug Mode (this can be enabled after starting HWiNFO32/64 in the "Configure" section). Then continue with the scan process. After the scan is finished, please close the application (in case of a crash or freeze, reboot the system). Running HWiNFO32/64 in Debug Mode might be considerably slower than in normal mode (especially running from a flash drive or certain sensor scanning). In case you would like to report an issue with sensors, please don't forget to open the Sensor window prior to creating the Report File and closing application. If you experience a system crash, hang or BSOD, make sure that the "Debug Write Direct" option is enabled too, otherwise the resulting DBG file might not contain all information. 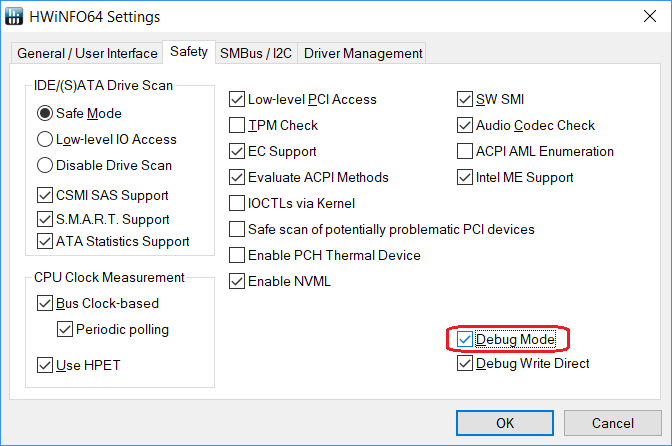 If the welcome screen of HWiNFO is disabled, so it's not possible to reach the Settings screen, Debug Mode can be enabled by editing the HWiNFO32.INI or HWiNFO64.INI and changing "DebugMode=0" to "DebugMode=1".